Bunker’s destination-restaurant status is due in no small part to its oasis-in-a-culinary-desert location on an industrial stretch of Queens that’s either Maspeth or Ridgewood, depending whom you ask. (We’ll go by the joint’s business card.) But the designation owes just as much to its quasi-tropical, slapdash charm; prices that top out at $17.50; and grub so mind-bogglingly, bowl-scrapingly good you’ll be plotting your next trek before the check drops. The Vietnamese menu is the work of chef Jimmy Tu, whose ancestry (born in Thailand to ethnically Chinese parents who grew up in Vietnam) sounds like a business plan straight out of the Asian Hipster Cuisine playbook. Combine this lineage with Tu’s French training in fine-dining kitchens, and you get a playful approach to Southeast Asian classics with an emphasis on pedigreed ingredients. You also get a roasted portobello bánh mì (with Havarti, smoked Gouda, and basil-peanut pesto), the kind of whimsical concoction that defines this moment in high-low cuisine. Service is quick and friendly, the dishes are plastic, and flatware arrives in a tin can. But then there’s the food: the shrimp-and-bacon-studded crêpe called bánh xèo, crisp and sticky on top and eggy-tender within; the primally comforting suòn nuong xá, char-grilled lemongrass pork tenderloin with a fried egg and rice; and the ca ri ga, chicken curry to end all chicken curries, served with a greasy, flaky roti to ensure that not a drop goes unsopped. Whether you visit Bunker by car, train, Citi Bike, skateboard, or covered wagon, it’s categorically worth the trip. 46-63 Metropolitan Ave., Ridgewood; 718-386-4282. Georgian (the country, not the state). Out of all the former Soviet republics, Georgia has the best grub. Or so say the Georgians of our acquaintance, discriminating foodies to a one. The nation’s leading culinary export, judging by its growing prevalence on these shores, is khachapuri, a category of flatbread variously stuffed and topped—most often with a combination of melted cheeses but sometimes with things like pinto beans or even bacon. There was a time when khachapuri addicts had to trek out to Coney Island for a gooey fix, but these days, Georgian spots are springing up if not all over, then at least throughout the ethnic enclaves of southern Brooklyn. For an introduction to the gutsy, garlicky pleasures of this Transcaucasian cuisine, take a carb-fueled field trip to these new arrivals: Brick Oven Bread, also known as Giorgi & Aunt Inc. (230 Kings Hwy., nr. W. 9th St., Gravesend; 718-759-6250), where the affable owners (Giorgi and his aunt, presumably) turn out a solid array of khachapuri, in addition to the salads and vegetable dips Georgia is famous for (we recommend the house pkhali, a coarser-than-usual blend of spinach, ground walnuts, fresh herbs, and a spice mix that Giorgi imports directly from the old country). From there, shoot down to Berikoni (125 Brighton Beach Ave., at Brighton 1st St., Brighton Beach; 718-708-5040), a bustling new bakery and deli hunkered beneath the elevated train. This seems to be a favored post-beach stop for famished locals, which means high turnover ensures a constant, piping-hot supply of cheese bread, plus the crusty tandoor-baked loaves called puri (round) or shoti puri (long and swollen in the middle), depending on their shape. Finally, take the Q two stops to Apani (1520 Sheepshead Bay Rd., nr. E. 16th St., Sheepshead Bay; 347-462-4733), a bakery and takeout shop that veers into such experimental New Age territory as whole-wheat shoti puri and spinach khachapuri and will sell you the titanic Georgian soup dumplings called khinkali by the piece. The biggest news on the Georgian-food scene, though, is the cuisine’s advance to Manhattan, where ebullient expats cluster every night of the week at East Village newcomer Oda House (76 Ave. B, at 5th St.; 212-353-3838). Here, not only will you find a top-notch adjaruli khachapuri, stuffed with feta and mozzarella and topped with a poached egg, but also Georgian wines served in traditional clay cups and a soulful folk band on weekends. As a general rule, you don’t go looking for carnitas tacos in porchetta-sandwich shops. But there they are, the terrific new weekend special at Sara Jenkins’s little East Village pork pen, Porchetta: two good-quality tortillas loaded up with nuggets of sweet and creamy pig flesh topped off with an avocado-enhanced salsa verde of such vivid flavor and distinction you feel sorry for all other salsas verdes. The man to blame for these stupendous morsels is Sammy Estevez, a Puebla native and Jenkins’s right hand in the Porchetta kitchen. Surrounded by all that fat-swaddled pork, Estevez recently decided to set aside some tender rib meat, braise it in freshly squeezed orange juice and Coca-Cola, and make some tacos. “It’s how I do it at home,” he says with a shrug. But that’s the way these culinary geniuses are: modest to a fault. 110 E. 7th St., nr. First Ave.; 212-777-2151. East River Bread’s bagel, lox, and cream cheese. In recent years—make that decades—it has been enough for most people to bemoan the sorry state of the New York bagel, a puffy, overgrown, and toothless thing bearing little resemblance to the original. But Melissa Weller, former head baker at Per Se and Roberta’s, is not most people. Think of her as the bagel avenger and her East River Bread stand at Smorgasburg as a window to an evanescent hand-rolled, boiled-and-baked past. 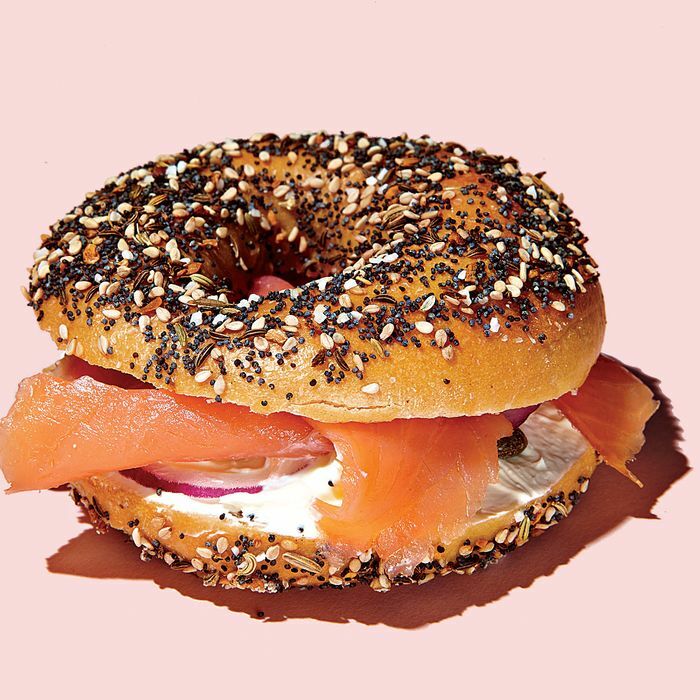 Is $8 too much to pay for that prototypical New York Sunday brunch, a bagel with cream cheese and lox? Not when the properly modest-size dough balls are this chewy and flavorful, thanks to a sourdough starter and slow fermentation. Weller makes her own silky cultured cream cheese from local milk and cream, cures her own salmon, and garnishes the whole package, as tradition dictates, with red onion and capers. Get yours on the amped-up “everything” bagel, bedecked not only with sesame, poppy, garlic, and caraway, but also fennel and sea salt. At Smorgasburg, N. 7th St. at Kent Ave., Williamsburg.